Last summer, researchers at the University of Illinois revealed that most bees aren’t as busy as we give them credit for, and a small group of workers handles the bulk of the labor in a hive. 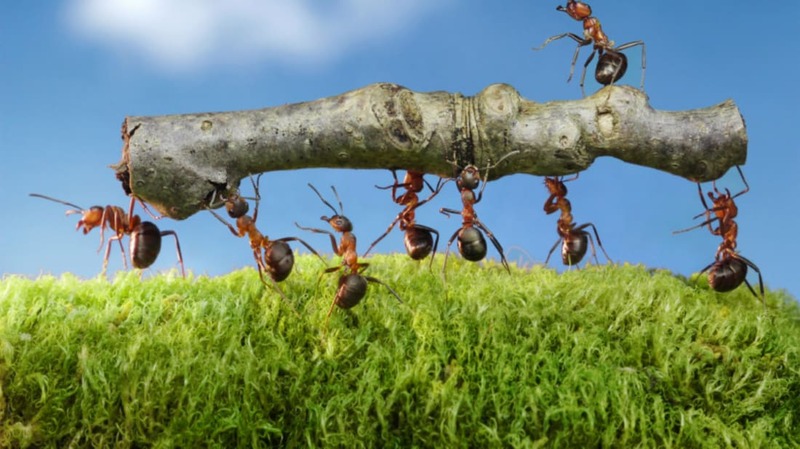 Now, another research team has taken the famously industrious ant down a peg, showing that many ants don’t do their fair share of work—or any work at all. In many types of social insect, entomologists have found workers that really don’t do much. In some cases, researchers report that half or more of the bugs in a colony are inactive and spend their time just hanging around. Daniel Charbonneau and Anna Dornhaus are biologists at the University of Arizona’s Social Insect Lab, where they primarily study Temnothorax rugatulus, a species of ant found throughout the Western U.S. and Canada. They’ve seen plenty of lazy ants first-hand during their research, but it wasn’t clear whether these ants were consistently inactive or simply taking a break or working in shifts. In a new study, the pair shows that these ants are dedicated to being bums, and that might actually be their job. The scientists collected five colonies of the ants around Tucson and, using a microscope and thin wire, painstakingly marked 250 workers with unique combinations of paint spots so they could be identified and tracked. They let the ants go about their business for three weeks and recorded them on video for a few minutes at regular intervals. They then went through their footage and recorded what each of the tagged ants was doing. They found that around 25 percent of the ants were inactive throughout the study. Differences in rest schedules and work shifts didn’t explain the difference, because no matter what time the videos were taken, the same ants were still standing around. These ants were so consistent at doing nothing, the researchers say, that it looks like some workers “effectively specialize in ‘inactivity’” the same way others specialize in foraging for food or tending to the colony’s larvae. Why do so many ants dedicate themselves to doing so little? Charbonneau and Dornhaus’ study didn’t try to figure that out, but they suggest plenty of ideas that can be tested. First, they say, the inactive ants may have a job to do that they just didn’t see during their short window of ant-watching, maybe a task that’s only performed at a certain time of year or at a specific point in the ants’ life cycle. These particular ants could have also been too young to start working, or too old to continue working and were living the easy life of insect retirement. They might also be a kind of reserve work force that springs into action when other workers die or the workload in the colony suddenly increases, though other studies testing that idea with different insects found little support for it and showed that when more labor is needed, the ants that are already working just work harder and increase their activity. Another possibility is that the lazy ants are “behaviorally idle” but not “functionally idle,” and have jobs that don’t require much movement or look like work, such as acting as live feeding stations and regurgitating food for other ants when needed, or relaying chemical messages around the nest. Finally, the researchers say these ants might just be selfish, shirking their assigned duties so they can conserve energy and minimize their exposure to danger. “Ultimately, the question of why colonies would produce so many inactive workers, in spite of potentially high production and maintenance costs, is still very much a mystery,” the scientists write, one that will be solved only with more experiments testing all these ideas and others. For now, they urge other ant researchers to not write inactive ants off as inefficient or unimportant just because they don’t do active tasks. Lazy ants are a distinct group with their own unique set of behaviors and characteristics, they write, and ignoring them and their main “activity” in certain studies may skew our understanding of ants’ social structure and division of labor.